Recently I’ve been continuing to play with Fimo, in particular the Classic range. 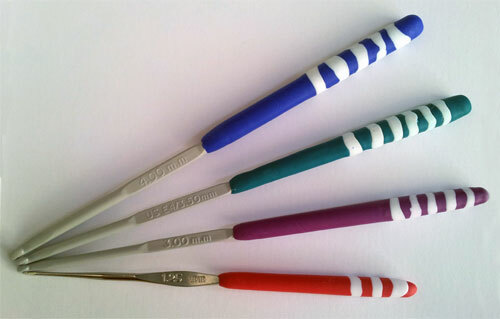 For my first project I decided my crochet hooks could be livened up a little and created these stripy brightly coloured handles. They are really easy to crochet with (I thought they might be too heavy, which they’re not) and I can now easily identify which size I need (currently using the green one for my ripple blanket project). Folk art is getting to be quite addictive! I’m loving the simplicity of it and the endless effects you can create by mixing different patterns, textures and accessories together. 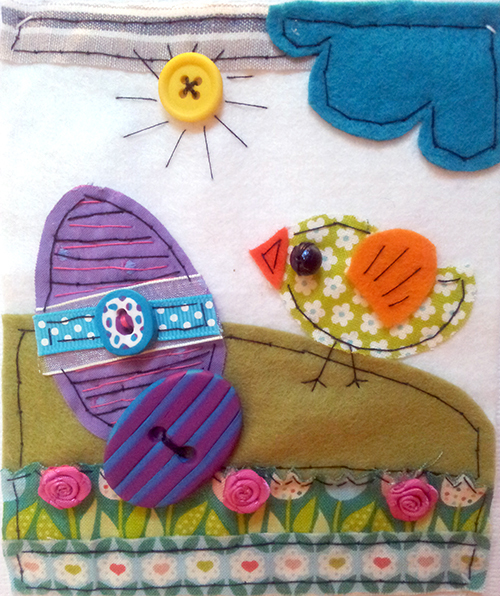 To make this Easter card I’ve used felt, cotton fabrics, home-made fimo buttons, beads, buttons and little rose buds. They were all hand-stitched using a simple couching stitch and the piece was then stitch-mounted onto card. I’ve always had a love of buttons, which started with me rummaging through the button tin when I was a child. As a student I lived in Cardiff, where I came across the Claire Grove button shop and I felt like a kid in a sweet shop. It was here that I first discovered Fimo buttons (she had a huge selection) and I loved the not-so-perfect finish to them and their individuality and used them as a great way to customise my clothes. Anyway, more recently I’ve been making projects that I’ve wanted to add buttons to, but rather than buying buttons I’ve decided to keep with the hand-made theme and make my own. 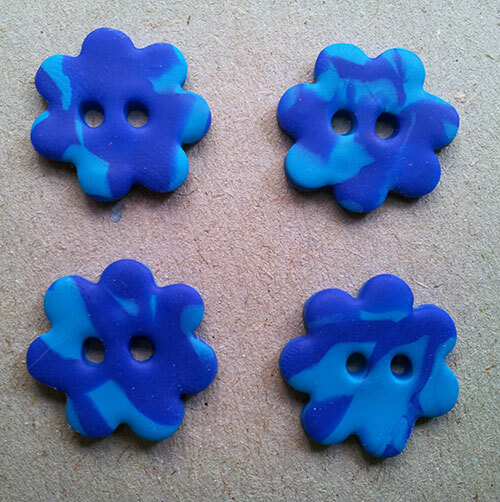 I’ve used Fimo Classic as I needed the buttons to be strong and durable. There are other polymer clay brands on the market but they all have their pros and cons and it really does depend on the type of product you make as to which you use. There is nothing to stop you mixing and matching them to get the look you’re after. The buttons above are all a large size, that could be used as a statement piece on, for example, a bag, coat or knitwear, whereas the buttons below are all smaller and would make an interesting embellishment to smaller projects.